Dad Dad Mom Mom is a picture book series that features the episodes in the lives of Dad and Dad, and Mom and Mom. Its aim is to create a picture book universe for children of Same Gender Couples. STORK M.I.A. is the first volume of this self-published children's book series. It follows the story of Dad and Dad, who were tired of waiting for the Stork, and decided to find her and ask for a baby. They search for the Stork around the world, with the help of Mom and Mom, turning this story into an adventure, rather than a didactic book for children of same gender couples. 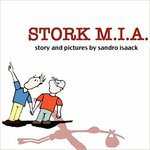 Isaack, Sandro, "Stork M.I.A." (2009). DIVerse Families. 266.